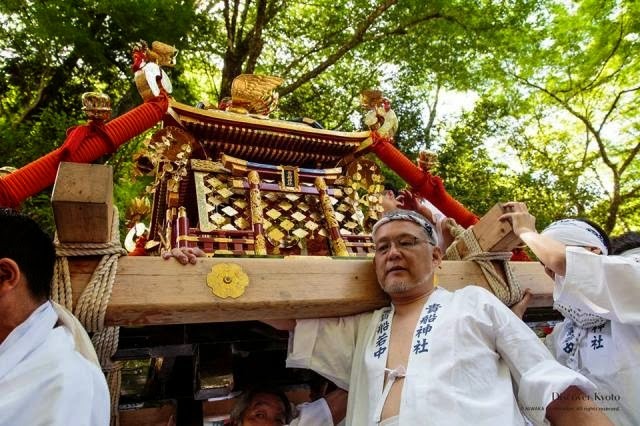 Legend says that the goddess Tamayori-hime appeared in Osaka Bay aboard a yellow boat, declaring that a shrine should be built and local spirits deified wherever the boat's journey ended. 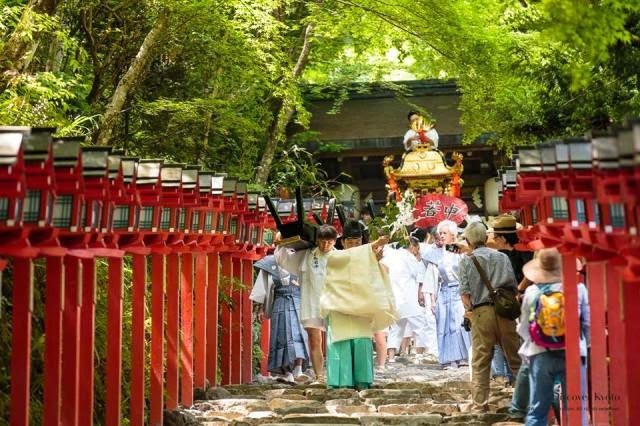 Founded more than 1600 years ago, that place became Kifune Shrine, two local water gods became the enshrined gods, and from that point on Kyoto's people looked to Kifune Shrine particularly for matters pertaining to rainfall and harvest. 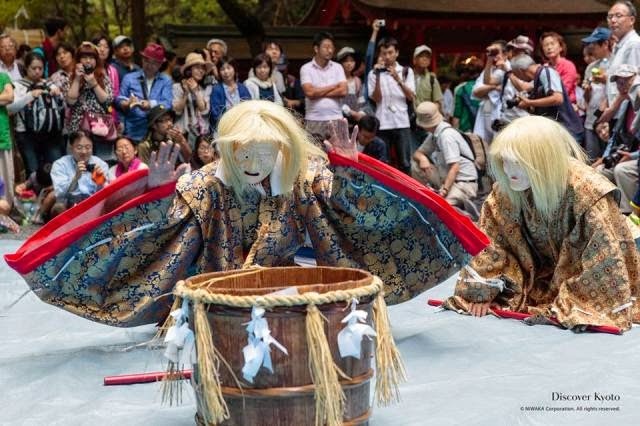 In times of drought locals would offer a black horse to the gods praying for rain, and when praying for the rain to cease would offer a white horse. 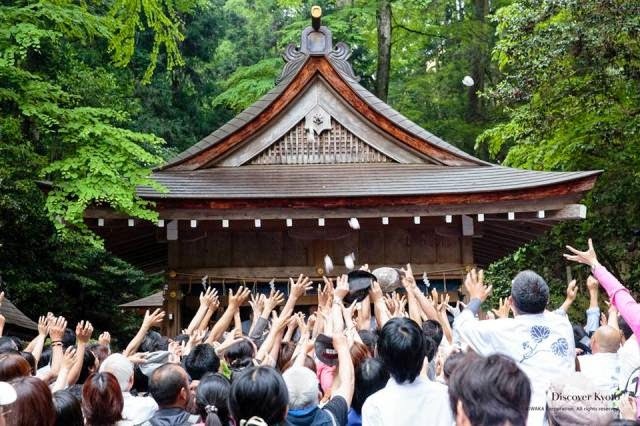 Even today Kifune Shrine remains connected to matters dealing with water, and votive prayer tablets illustrated with horses are still offered with prayers. 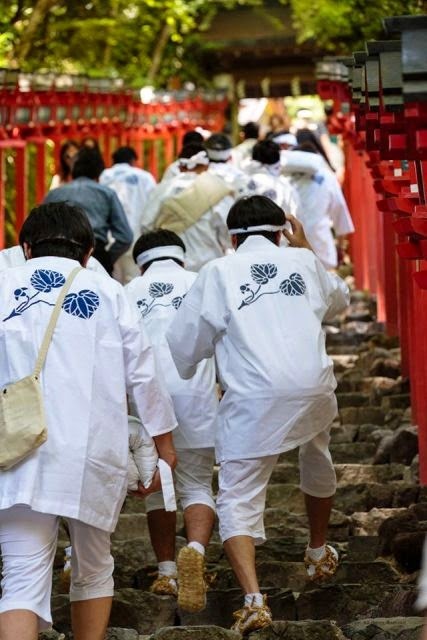 On a warm day in June the Kyoto Fan team packed up their bags and headed to the northernmost part of Kyoto City, aiming for the cooler air of Mount Kurama. 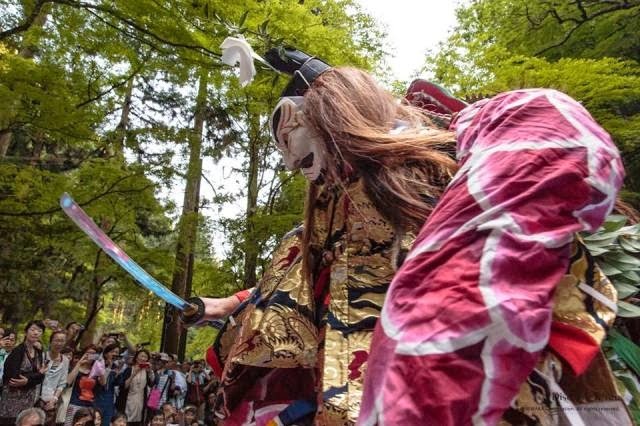 With two peaceful villages on either side, Kifune and Kurama, the mountain area is a popular destination with tourists and Japanese alike, especially those looking to escape the summer heat. 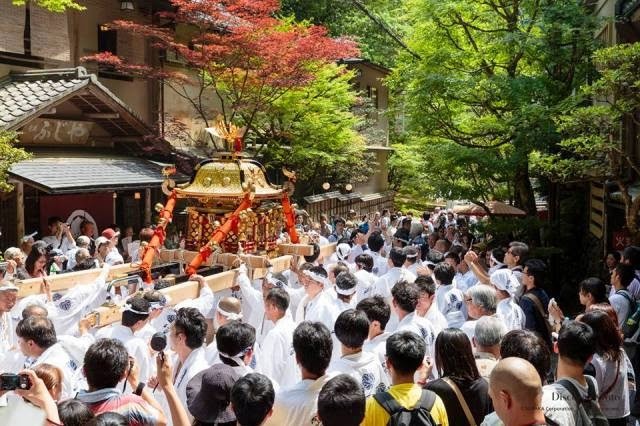 Even more people than usual were heading out on the 1st, however, to take in the Kifune Shrine's annual Kifune Festival. 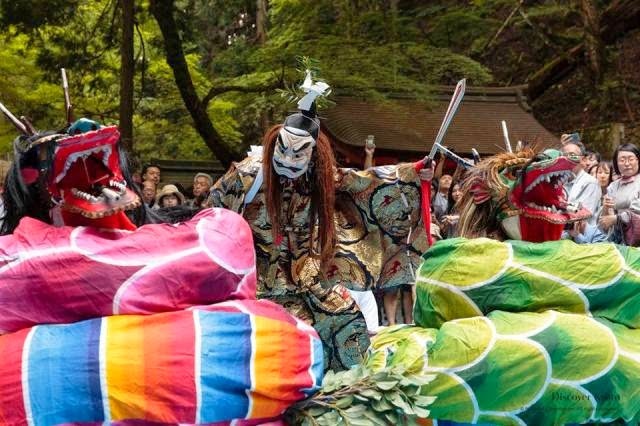 Held at the changing of the seasons, the festival is a lively one with multiple happenings throughout the day from morning until evening. 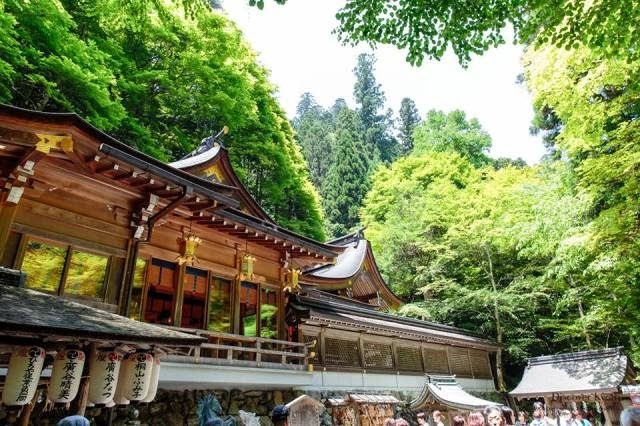 From the morning rituals are held at the main hall, and in the inner sanctuary prayers and reports are announced to the gods. 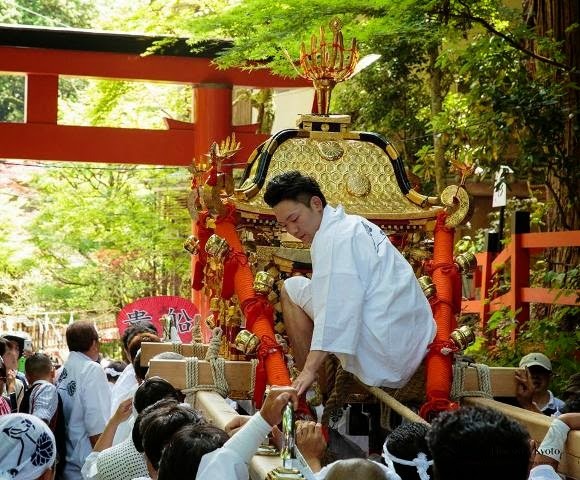 The gods' "wardrobe" is also changed to something more befitting of the season. 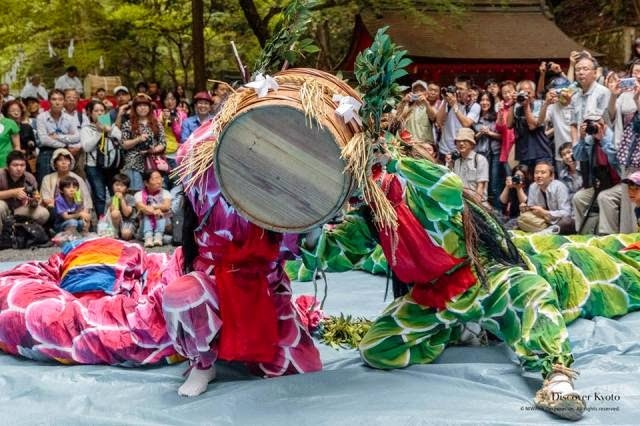 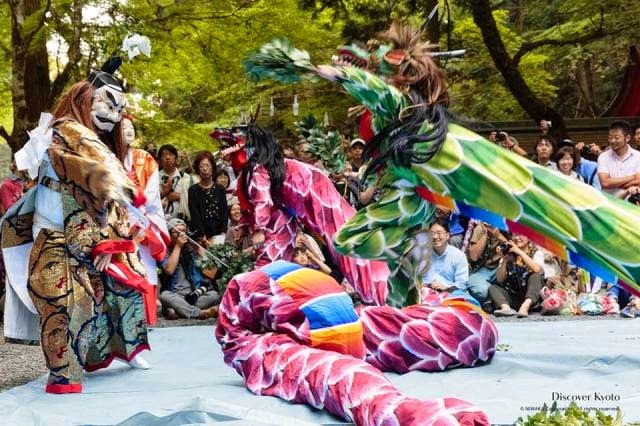 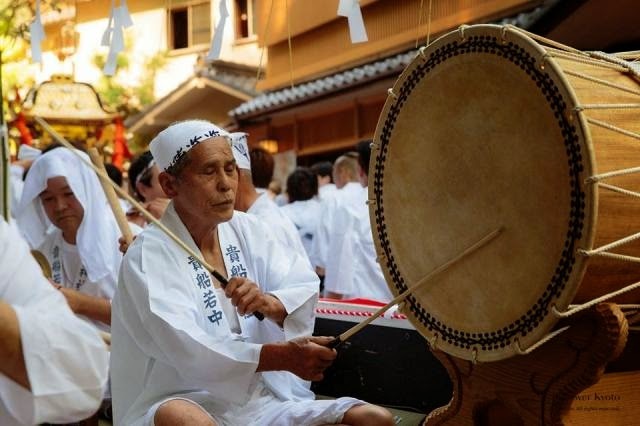 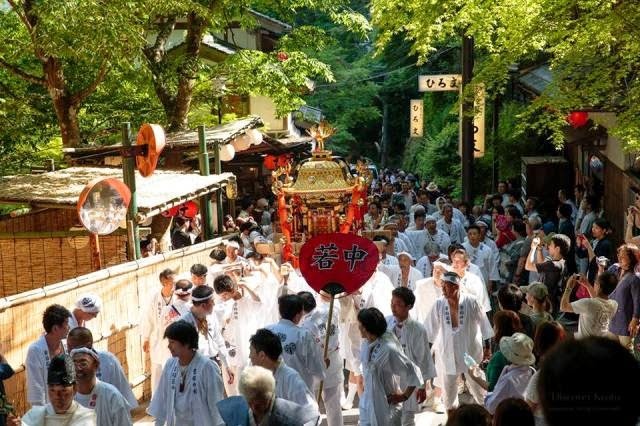 From then, the festivities move in to the public eye with a court dance offering before the people take to the streets with the portable shrine and head around the neighborhood and then on the inner shrine to put on a show! 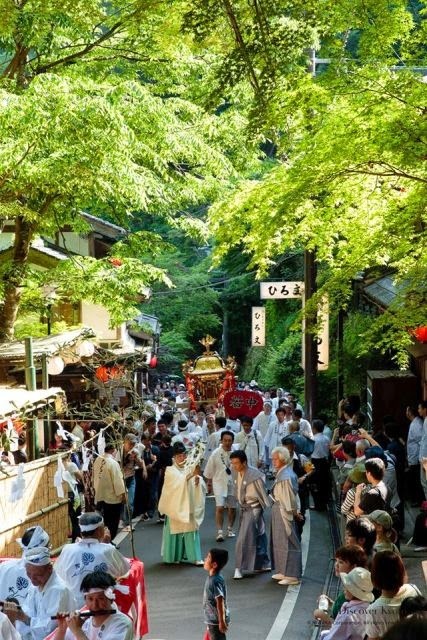 Fresh green summer leaves provided an overarching ceiling for the narrow streets. 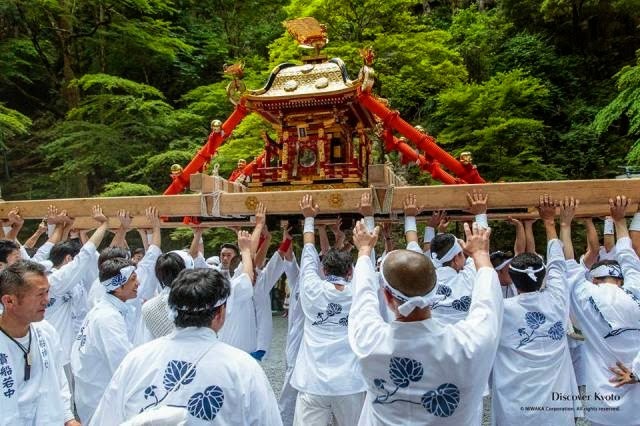 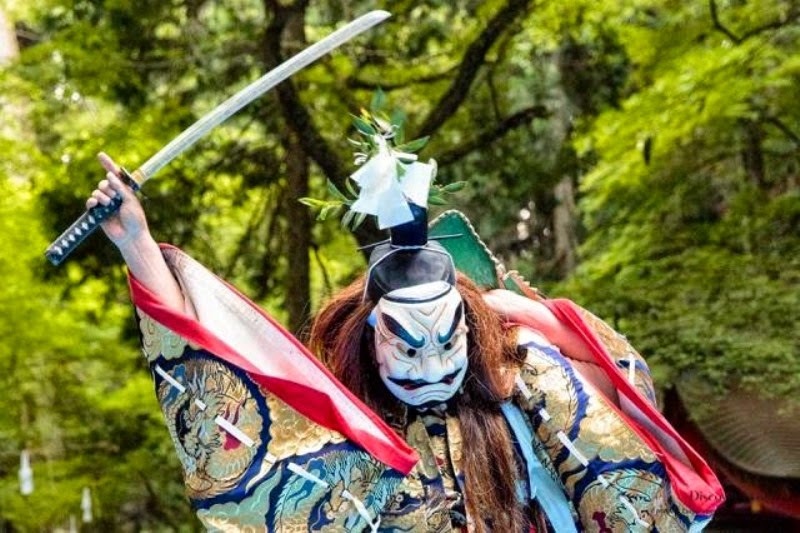 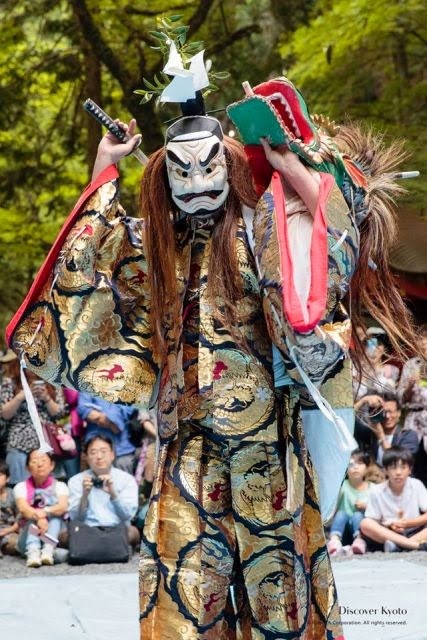 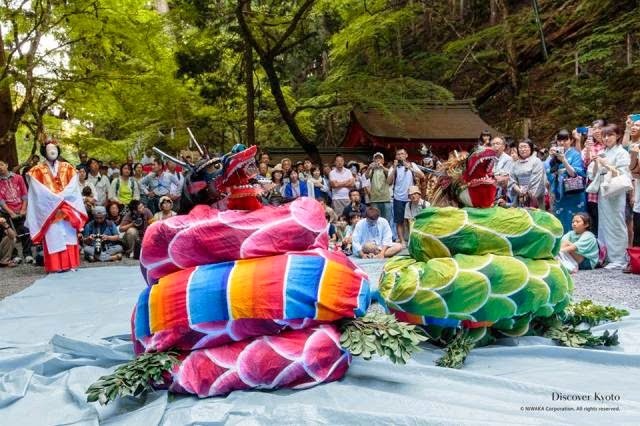 The large fan carried by one of the parisioners reads "in our youth"
Izumo Kagura, a type of sacred dance that tells the story of the god Susano'o and his defeat of the serpent Orochi, is dedicated to the Kifune Shrine gods. 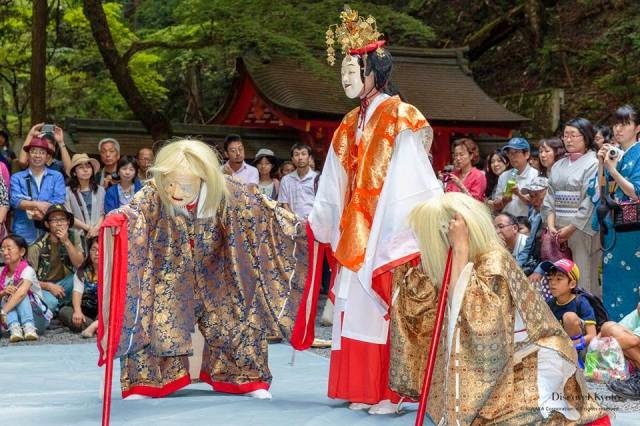 Here the princess Kushinada is being escorted by her elderly parents to be sacrificed to the giant snakes. 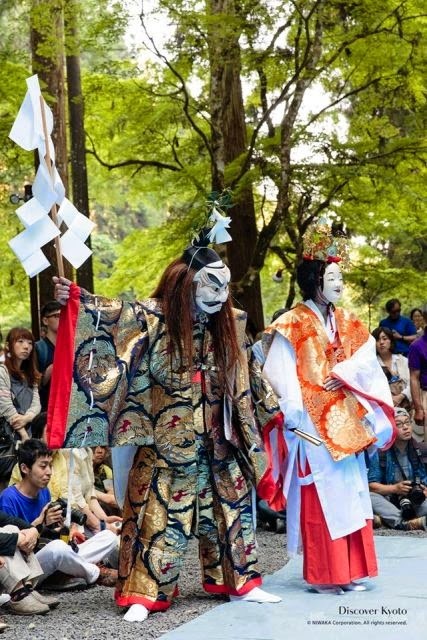 Everyone assembled seemed to really enjoy this close-up look at such an exciting kagura performance. 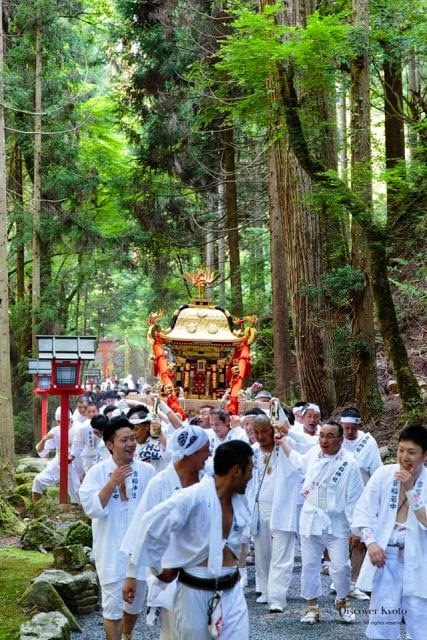 Combined with Kifune Inner Shrine's natural atmosphere surrounded by trees, it seemed even more real.